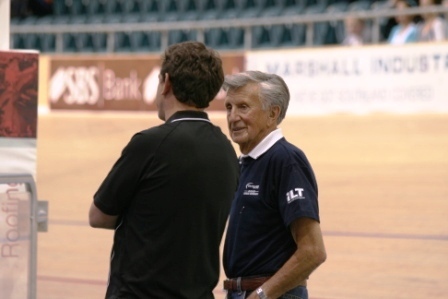 22/02/2011 - As you watch New Zealand’s best riders powering around our world-class ILT Velodrome, take a moment to reflect on how cycling has evolved in Southland – it’s a remarkable journey. One man in particular – coaching stalwart Laurie Tall – knows the full extent of the progression that’s taken place. From racing himself on grass tracks to the opening of not one, but two elite cycling facilities in Invercargill, Tall has witnessed many milestones in our sport. A large Cycling Southland contingent will contest the RaboDirect National Elite and Age Group Track Championships in the hunt for national titles – a feat first achieved by Tony Ineson in 1963. “The first year we formed the centre, we won the 100 mile national title up in Wellington courtesy of Tony Ineson,” Tall recalled. “He was the first actual Southlander to win a national title for our province – the others were Southlanders but they rode for Otago or Otago/Southland previously. Chopping wood and growing potatoes, the cycling fraternity rallied to raise funds for the development of Kew Bowl. “It was a class track – there’s no doubt about that,” Tall said. “We realised the smaller the track, the better the entertainment is for the public. Most of the tracks around the country were about 400-500m round but when we built Kew Bowl it was decided to make it five to the mile which is 331m so we were practically the smallest oval track in New Zealand at the time. img src="http://cyclingsouth.org.nz/files/20110224212650-1298536010-5.jpg" border="0" alt="Laurie Tall 1948 Caledonian Games in Invercargill" title="Laurie Tall 1948 Caledonian Games in Invercargill" width="250" height="166" style="float: right; margin-left: 5px;" />The track developed a reputation for turbulent conditions courtesy of the Southland’s notorious weather. “The rain used to go parallel to the ground with the wind behind us,” Tall said. “We had a couple of go’s at covering the bowl … but it was £75,000 pound to cover the track and 14ft of the inside edge. A hot air balloon-styled roof was also investigated – similar to the old Otepuni Ave ice skating rink. Construction of the ILT Velodrome earned Southland another New Zealand first – and solved the problem with the elements. 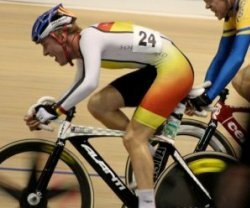 While the country’s only indoor velodrome revolutionised the sport, Tall’s highly-regarded coaching techniques remain largely unchanged. “The basics are much the same as we’ve done for many, many years,” Tall said. International success had boosted cycling’s profile and modern riders were producing some remarkable achievements. “You just can’t compare times on a concrete track to ones we’re seeing now on the boards … they’re hitting big speeds. You take motor-pacing with the sprinters where they’re clocking speeds up to 70-75 kmh,” Tall said. The thrill of the elite cyclists soaring around the track was a huge public drawcard, but for Tall watching the juniors perform brought the most satisfaction. Many youngsters have benefited from Tall’s guidance, including Commonwealth Games medallist Eddie Dawkins, who started pedalling competitively on the concrete of Kew Bowl. Tall was eagerly anticipating the national fixture. “There’s quite a few talented under-19 and under-17 riders coming through,” he said. “The likes of Pieter Bulling – I always call him a freak. It took me two years to get him to race. “Pete would come down here with Waihopai School and I used to say to him `I’ll make a champion out of your one day’. “This went on for two years until his mother came to me one day and said `do you think he could be a bike rider?’ and I said `I don’t think, I know’. And that’s what makes a coach proud.